Choice Eliminator will eliminate options from a multiple-choice, list, or checkbox type of question. 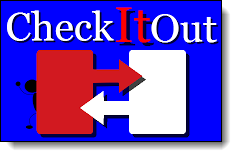 Great for signing up for time slots or having students choose topics without doubling up. 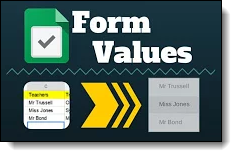 Form Values allows you to store and use lists that you use regularly in forms. This could be a list of staff, students, timings, rooms, resources or anything you want. Used for checking in and out items, this add-on will create a question set or multiple sets. One question is for items that are IN and another for items that are OUT. Questions can be Multiple-Choice, List or Checkboxes. When someone fills out the form selected items will be moved between the two questions. This allows a for a very easy check in/out form. Recycle questions from other Forms in your Drive by selecting them in the Sidebar. Just pick the Form in the popup window and it will populate with the questions from that Form. 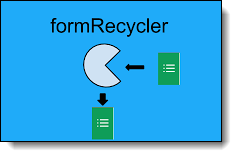 Select the ones you want to insert and the formRecycler will automatically insert them at the end of the Form. Create graphs, statistical displays, multiple choice questions, and write complex math directly in your Form. You can also deploy a Form to allow responders to craft responses using g(Math) tools. 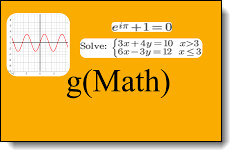 This is an invaluable tool for any math class or math teacher. Appends Google Form question responses to the bottom of selected Google Docs. 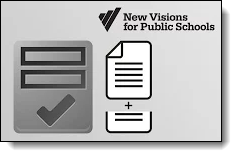 Use a Google Form to select which Doc(s) to append from a list, multiple-choice, or checkbox Form question, pre-populated with Doc titles from a folder in Drive. The Data Director for Forms Add-on has multiple features. It can send the form response to an alternate spreadsheet. It can send an email or multiple emails when the Form is submitted. It can add a guest to your calendar event. 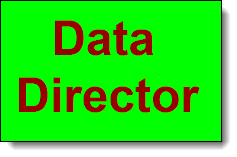 Data Director will also create an Edit URL and/or a PreFilled URL, and save those links to the spreadsheet. Advance Summary of responses generates charts and filters based on a Google Form responses. Advanced Summary of Responses takes advantage of Awesome Table to quickly build a summary of your form responses. You can select the items to display, and the summary will automatically update. 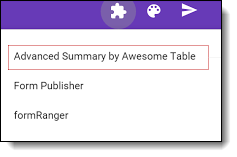 Do you have favorite Add-ons for Google Forms that are not listed above? Please share your favorites, or how you have used Forms Add-ons, in the comments below.